Each live event blends stories and examples from his own extensive leadership background, customized with in-depth preparation about the organization and competitive environment. Resultant, each audience can count on a stimulating experience with relevant, thought-provoking questions that force them to challenge their thinking — and specific actionable ideas that motivates them to take action. 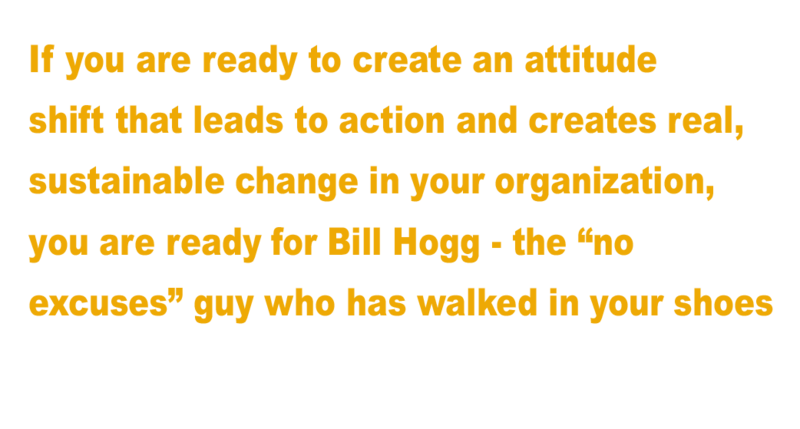 Often provocative, always stimulating, Bill’s keynotes use humour and real-life experiences to change people’s mindsets, ignite their passions and ultimately drive performance improvement. Looking for something different to energize and enhance your conference? A major strength that sets Bill apart is his ability to think on his feet and interact with audiences with humour and wit in an impromptu environment. This rare skill can help energize and enhance your conference through several formats beyond keynotes. Bill has experience working with audiences of all sizes to create unique interactive environments that include; Emcee Duties, High Stakes Facilitation, Platform Interviews, Passionate Panels, Customer Conversations and Fireside Wrap-ups.